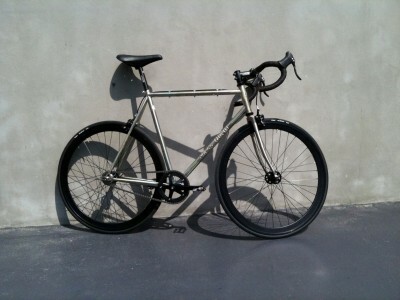 Wallpaper* invited a group of about 10 designers to ‘edit’ or reinterpret the Cinelli Gazetta frame for their ‘Handmade’ exhibition at Brioni in Milan during the Salone del Mobile 2011, and then organised a bike ride throughout the city from Brioni to the Paul Smith HQ on Viale Umbria. 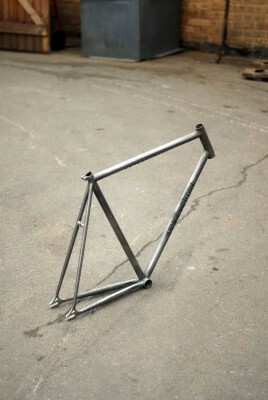 I received the brand new Cinelli frame just a few weeks before the exhibition and after a couple of weeks ‘playing’ with it I returned it to Cinelli in Milan for them to build into a complete bike ready for the exhibition and ride. 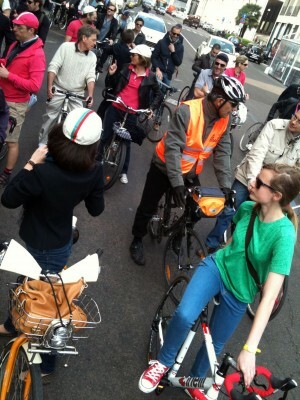 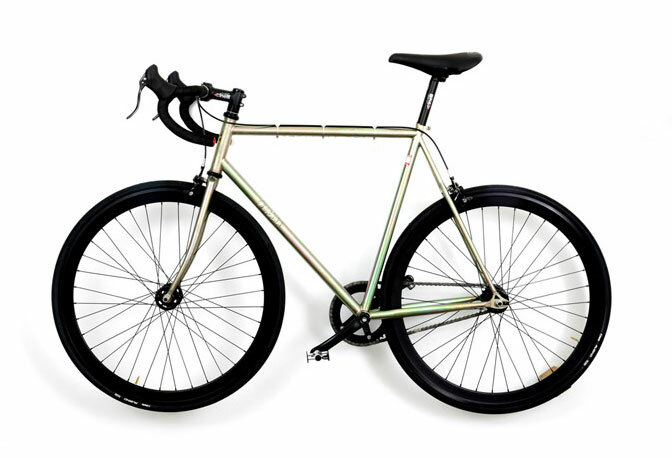 Since I moved to London in 2003 my daily rides have included Shepherds Bush to Archway, Wimbledon to Kensington, Wimbledon to Holborn, Hackney Wick to Holborn, and Tottenham to Holborn; on average 16 miles per day. 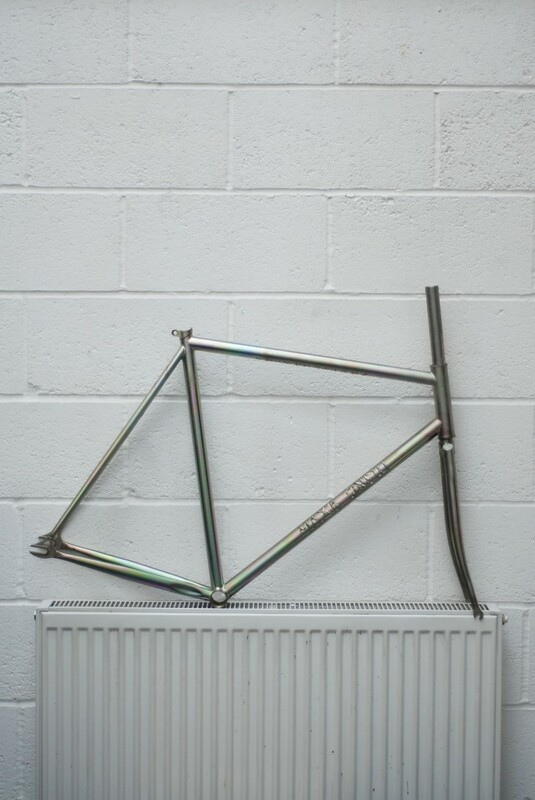 But since I started living in my Tottenham studio I don’t have a need to get on the bike on a daily basis to travel to work, although my bike is still my main mode of transport. 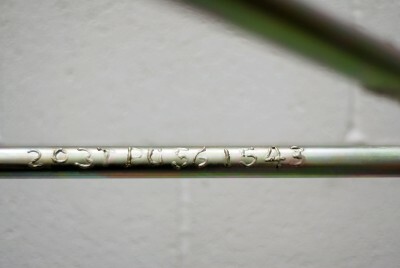 I have ridden various bikes in London since I have lived here and after one bike being stolen and two separate occasions when various components such as forks, saddle, handlebar/stem were stolen from my bike in broad daylight I decided to strip the fancy paintwork, reduce the components to bare minimum and fill every allen bolt head with car-body filler so thieves couldn’t steal anything. 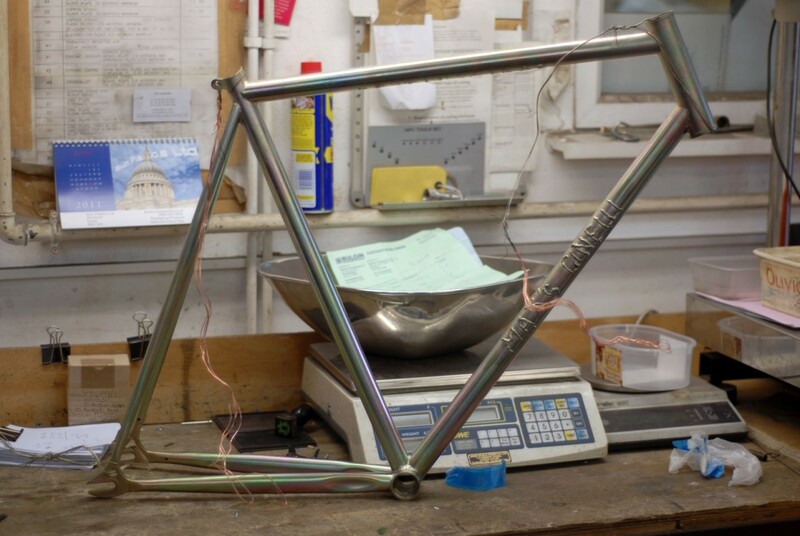 These experiences provided the main inspiration for my collaboration with Cinelli; how can I ride a beautiful handmade bike in London without it looking like I am riding a nice bike and without attracting the attention of opportunistic thieves? 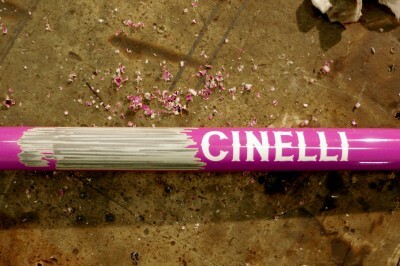 I was quite familiar with the history of Cinelli because of their intimate relationship with Columbus tubing through Antonio Colombo and his father’s involvement with tubular steel modernist furniture in the 1930′s. 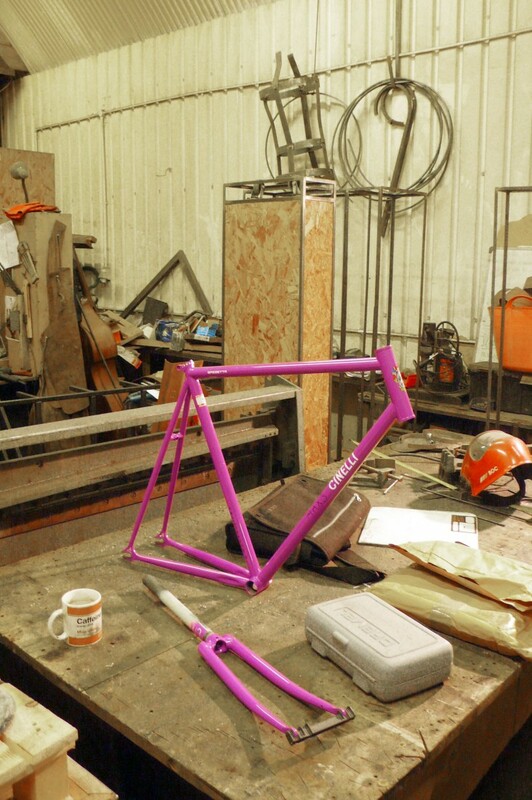 Although I had never owned or even ridden a Cinelli bike I was absolutely aware of the quality of the craftsmanship that goes into the creation of the Cinelli frames and components. 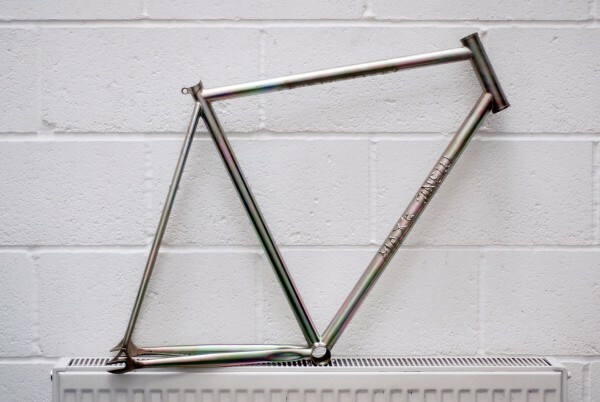 Quite simply I wanted to somehow celebrate the humble beauty of the Columbus tubing whilst exploring the idea of the ‘handmade’ bicycle and the possibilities when each frame is made one-at-a-time by individual craftsmen with highly specialised, time-honoured skills. 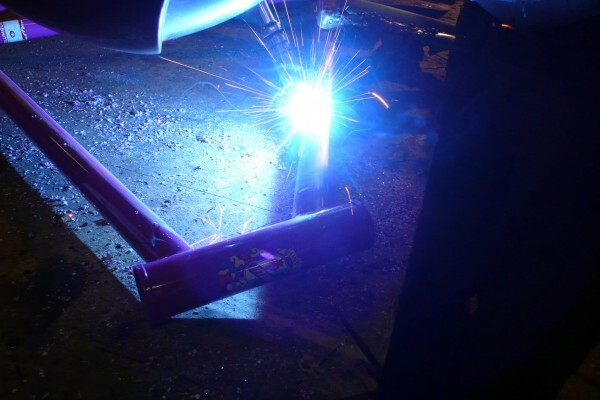 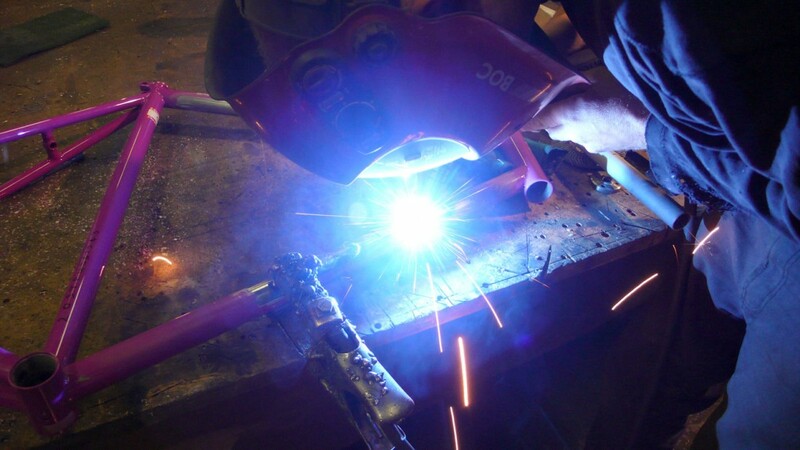 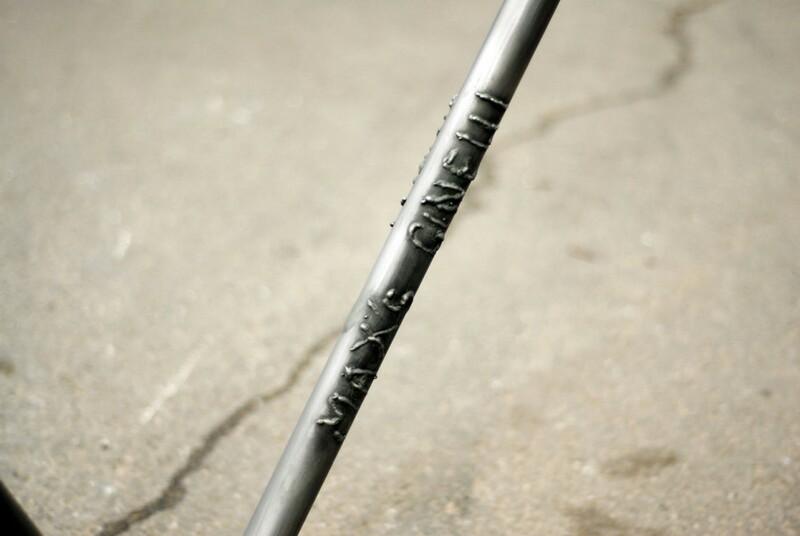 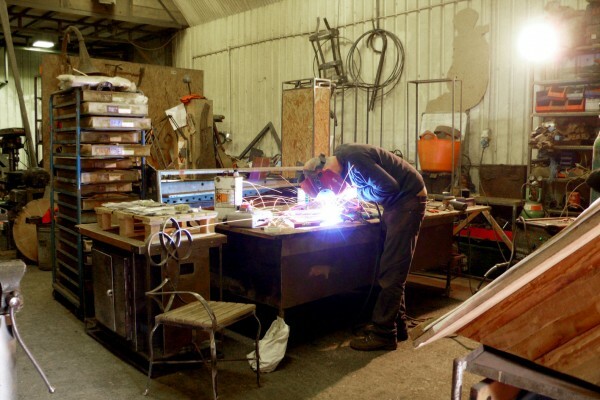 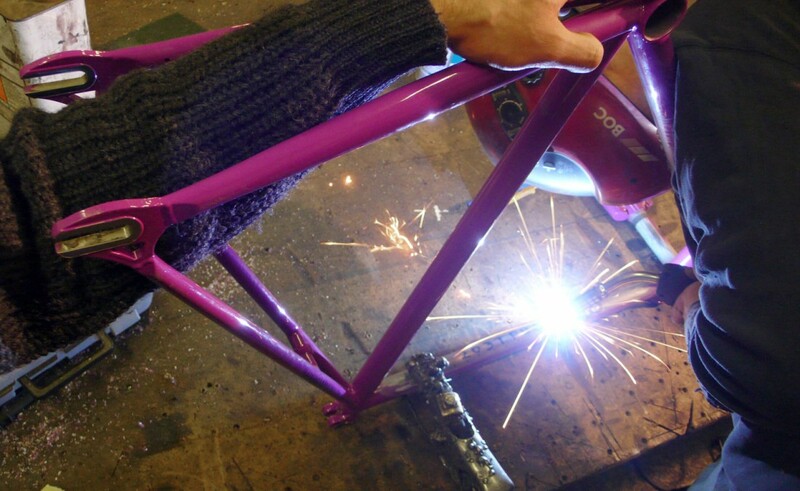 I decided to emphasise the fact that all the frames are welded by hand, thus offering the potential to personalise each frame during the welding process and in doing so create a deterrent to bike thieves. 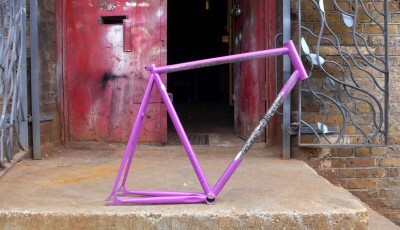 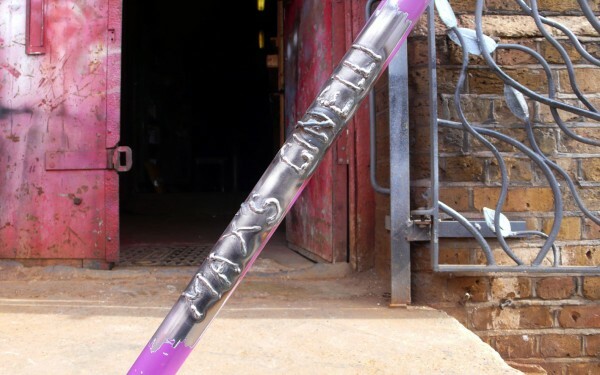 By stripping the (in my opinion not so desirable, but in the eyes of thieves very desirable) purple paintwork I exposed the raw steel tubing. 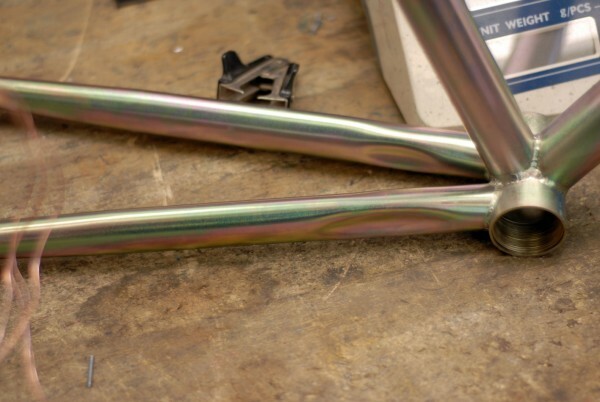 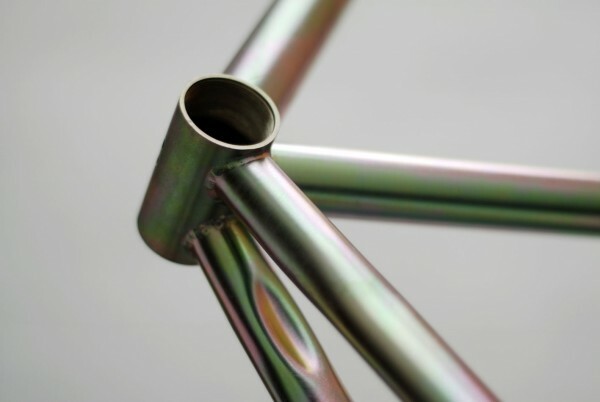 Being mild-steel corrosion is an obvious problem and so I chose to zinc-plate the frame and forks and apply what is known as a trivalent passivate which gives the surface an incredible iridescent, almost rainbow-like effect. 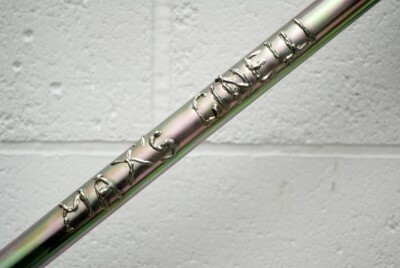 Zinc-plating also has the additional advantages of adding only a few extra microns of thickness and thus weight to the frame, whilst also protecting all surfaces of the steel tubes both outside and inside, unlike paint which simply coats the exterior and can lead to corrosion from the inside out. 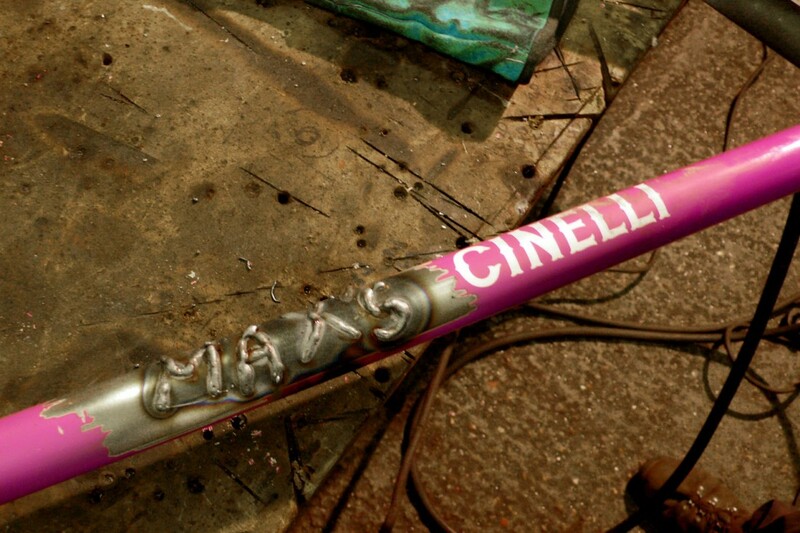 Before the zinc-plating process I decided to personalise the frame and re-apply the Cinelli brand by welding, rather crudely, ‘MAX’S CINELLI’ on the down tube and the serial number of the frame on the underside of the top tube, thus making the frame very easily identifiable and in theory creating a huge deterrent for unconscionable bike thieves. 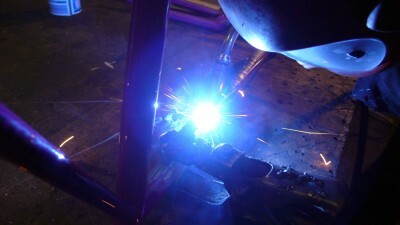 I hate thieves!